Ah, the beginning of the school year. I have a new desk, new co workers, and a whole new set of lessons I have to start planning. It's hard for me to not be anxious about the new year, because I like routines and this is shaking it up. I think once I get back into the swing of things, I'll feel better about school, since this week was a bit chaotic and I didn't teach much. But I'm still nervous about my new co teachers (though they both seem nice and like it will be nice to work with them). I have a different desk in the office now, so I can talk to Young Ah easier. We're now diagonally across from each other, so I can lean over my desk and we can discuss how effing stupid the videos in the textbook are. My god, no wonder my kids don't like to concentrate in class! The videos are hilariously awful! Anywho, I've also started an instagram challenge called 100 Happy Days, where I post a picture every day of things that made me happy. It's supposed to help you have a more positive outlook on life and all that, plus it's nice to remind yourself of things that make you happy. It kinda goes along with a really great Vonnegut quote that I'm trying to adopt- "I urge you to please notice when you are happy, and exclaim or murmur or think at some point, 'If this isn't nice, I don't know what is.'" who doesn't love being complimented? So that's what I'm up to. If you have instgram, my name is just christinadicillo. I post random pictures on there about my life in Seoul. It's more snapshots, rather than the big overview like FB is. And now we move on to the main point of this week's post: PHANTOM. You've all probably known this was coming for a while, as I booked this trip in December and have been casually mentioning it ever since, but still. This Saturday, we boarded a morning train bound for Daegu, a city in the south. It's like the 4th largest in Korea, maybe? 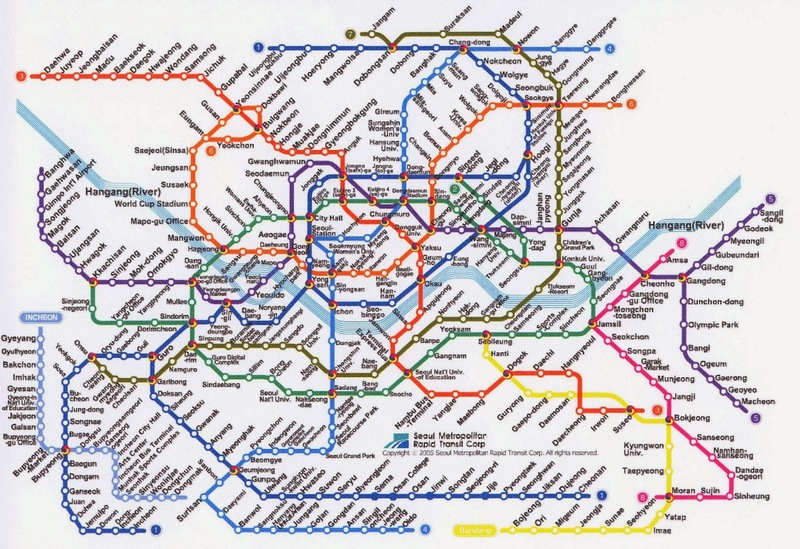 But to give you some perspective, here's what Daegu vs Seoul looks like, in terms of the subway. So yeah, there's that. There isn't a ton to do in Daegu, and we only had a short time anyway. Let's be honest, I was there for one reason and one alone: Phantom of the Opera. I was not disappointed! This was the beginning of the school year, but this week also involved another beginning- a flashback to the beginning of my obsession with all things Phantom related. And then we headed off to the show! I was bursting with energy and excitement, because I was just so elated to be able to see the show again. It's been over a year since my last one, and I really wish I lived closer to the show (which would be good for my Phan heart, not so much for my wallet). I wish everyone could feel the way I do when a performance of Phantom starts, or that you all could feel what I feel during the show, so my obsession would make more sense... My heart feels so happy that I feel like I might burst. I regularly get chills throughout the show. The overture and the rising of the chandelier... the descent into the lair, the music, the costumes, everything. It's all just SO breathtakingly gorgeous that I occasionally have to remind myself to breathe while I'm at the theater. The night before isn't usually exciting for me, but this performance is different. It hits me that I am going to see the Phantom that started it all, and I get emotional just thinking about it. I knew I was going to be a wreck for the show, and I was grateful I would have Sarah with me for this exciting, overwhelming moment. She made sure her hand was available for me to hold all night, and I did have to utilize it quite a few times. I know I'm a bit bizarre, but I'm forever grateful that I could share this whole experience with one of my best friends, because she totally gets me and is always there for me. It's nice to know that I have friends who just laugh with me when I go skipping and twirling down the street in excitement and happiness. our seats, which were actually pretty decent. The show was incredible- not the strongest overall I've seen (I was blessed with an excellent ensemble in London) but still AWESOME, especially the leads. Brad's voice is a little nasally-er now when he has to do the high notes, but his lower register is AMAZING. He does a few less scream shouts than before, understandably so, but his Phantom is menacing and cray cray and ugh I love it. His final lair broke my heart. Believe it or not, I contained myself in terms of merchandise. I bought the program, because duh, but I have most of the CDs and DVDs (yes, even the Korean soundtrack), and I couldn't justify spending like $55 on a hoodie when I have a $60 tattoo that much more accurately expresses the fanaticism/love I have for the show. BE PROUD PARENTS. Sadly, while we were taking that photo, Anthony Downing, Raoul, got by us. Damn. But the most important part of the evening did happen! After waiting for about 30 minutes, I was beginning to get worried. I know it's never a guarantee that you can meet them, but I so desperately wanted to meet the man that essentially started my obsession 11 years ago. A taxi was waiting, and we (correctly) assumed it was for him. He came up the stairs in the stage door and I freaked a little bit. Then his manager person came out and I honestly thought he was gonna say like, leave him alone or something. But Brad had told him to let us inside the foyer because it was cold out. SO NICE. And yeah, I admit it. I started to cry a little. Not ugly sobbing or anything, I just teared up and got really emotional. So Brad actually asked me if I was ok haha. So I squeak-sobbed out "I'm sorry this is just really emotional for me because you were the first Phantom I ever saw 11 years ago in Buffalo!" I thought he'd be like "Oh, that's cool..." but his reaction was priceless. In hindsight, I kinda wish I had recorded it, but I also didn't want to be like, SUPER EXTRA creepy? And then as he was leaving (there were other people waiting for him, we weren't the only crazy ones! ), he was like "Christina, it was so nice to meet you. That is such a great story. Wow, that's so awesome. Thanks for coming, it was so nice to meet you!" I'm suffering a bit from my usual post-Phantom blues, wondering when I'll get to see the show again, but also suffering because it was something I was looking forward to for about 4 months, and now all of the sudden, it happened and it's all over. I'm a bit thankful it was in Daegu tho. If it comes back to Seoul someday while I'm here, I'll certainly be in trouble! It will be like London 2.0! Well, thankfully we got back early enough that I've had time to unpack, relax and wind down today. Hopefully my school life will get back to normal soon so I can stop being a little nervous every day. Time flies by pretty fast here, so I'm looking forward to the next, as of yet unplanned, big event or trip that is going to happen. I hope all is well at home and everyone is doing well. Remember that you all sprung forward and Korea doesn't bother with that crap, so I'm now 13 hours ahead of NY, adjust your lives accordingly! Much love to all my friends and family across the globe, especially this week, as all of you have probably dealt with my phantom love in some capacity! I had an AMAZING weekend, and I'm looking forward to a good week. LOVE YOU ALL!! Claire Lyon singing Think of Me. Damn, she's got a great cadenza. I love that dress! Also, you should totally do this on tumblr too!